Based on 657 customer ratings. 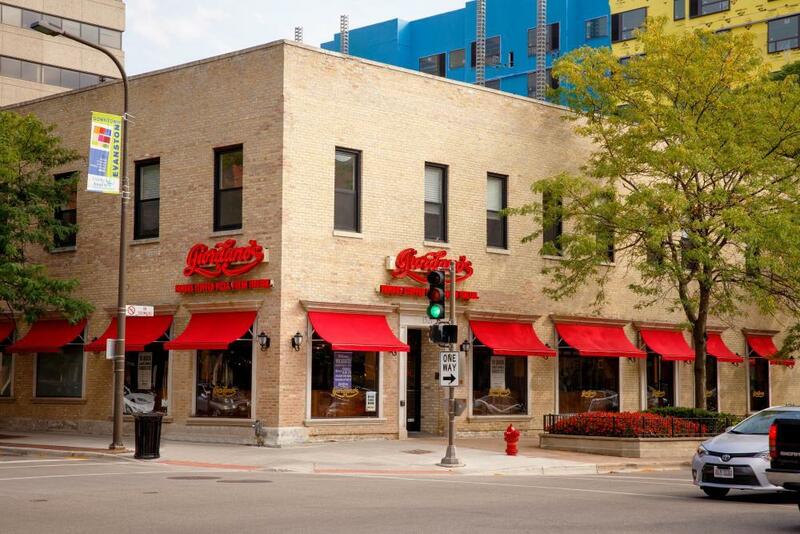 From the halls of Northwestern to the neighborhoods of Evanston, everyone knows Giordano’s! You don’t have to go all the way to Chicago to get our world famous pizza. Visit our restaurant, sit on our patio, and let us do the work — or order over the phone or online for delivery or pickup! There's no reason to travel to Chicago for great pizza. Our Giordano's location in Evanston, IL, brings you Chicago's best pizza right here in the suburbs! The City of Evanston lies north of Chicago. Northwestern University is a big part of Evanston and was actually founded before the city. The University opened in 1855, but Evanston was not officially incorporated as a city until 1872. In 1854, the founders of Northwestern University, including John Evans, submitted a plan for a city around the school. The community grew throughout the coming years, with especially large population growth from 1860 to 1870 and 1920 and 1930. Over the years, Evanston always wished to be independent of Chicago, and it has remained a unique city. Merrick Rose Garden: This garden has been open since 1948. Over the years, it has seen renovations and improvements to maintain it as a beautiful part of Evanston. Walk through the hundreds of rose bushes in different varieties of roses. Halim Time & Glass Museum: Stroll through the museum and see beautiful works of expert craftsmanship. You'll see clocks from all over the world and through different periods of time. You can examine more than 30 stained glass windows by American artists. Finally, you can observe the works of Louis Comfort Tiffany, an American Master. Lee Street Beach: Is your family looking for a way to get out of the house during the warmer months? Get season tokens for the whole family and visit whenever you want! Cool off by jumping in Lake Michigan and enjoy being outdoors with your family. It's a great place to unwind after a busy week and spend quality time together. When you are looking for a fantastic deep dish pizza in Evanston, IL, we hope to see you at Giordano's! When it comes to old school, Chicago-style deep dish pizza, there are lots of imitators — but there is only one Giordano’s! Since 1974, Giordano’s has handcrafted the best deep dish pizza in the Chicago region using old world techniques only our family’s proud heritage practices. Whether you’re looking for the flakiest crust or the freshest artisanal ingredients, Giordano’s is the best pizza place in Evanston. Regular pizza pies have toppings and cheese and crust. But only Giordano’s has cheese made exclusively for us from a small Wisconsin farm. Only Giordano’s pizza needs 6 trained artisans to construct each pie to our delicious standards. And only Giordano’s builds layer upon flavorful layer of the freshest meats and vegetables between two exquisitely flaky crusts so delicious that it’s like pie crust! Interested in hosting an at home event with more than our mouth-watering pizza, or prefer to enjoy pizza alongside something else? Order a hearty pasta dish or sandwich, or check out our fresh salads and gluten-free options. There is a little something special at Giordano’s for everyone!